In this game there will be a map filled with colored grids. Your colony starts with the home grid in the center of the map marked by a flag. 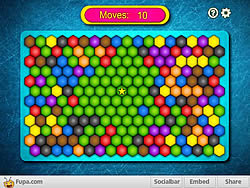 The goal of the game is to turn all the grids into the same color. You can change the color of your home grid and all connected grids by clicking on other colored grids in the map. Continue the process and you will be able to turn all grids into the same color. The fewer the moves, the higher your score.